Where there is smoke, there is fire. For this reason, according to the Kentucky Injury Prevention and Research Center, 13 out of 14 homes in the United States have smoke alarms. Unfortunately, 50 percent of home fires happen in homes that do not have smoke alarms. Sixty percent of fire-related deaths happen in houses that do not have smoke alarms. There is no reason for you and your family to be a statistic. Buying the best smoke detector on the market can literally save your life. In order to know what the best smoke alarm for your home is, you need to read smoke alarm reviews. We have created the definitive smoke alarm guide to help weed through the ineffective and mediocre smoke alarms and focus on getting the best smoke detector available for your home. Battery - Provides protection even during power outages when many fire and carbon monoxide incidents occur. 2 How Do Smoke Detector Works? 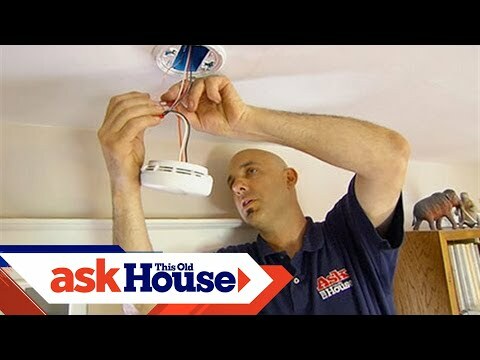 2.1 How Do Smoke Detectors and Alarms Work? 2.2 What Is a Photoelectric Smoke Detector? 6.1 How Many Detectors Will You Need to Install? We are happy to present what we feel are some of the best smoke detectors in this category. Our goal is to provide detailed smoke alarm reviews with the hope of making it easier for you to get the product that is going to best protect you and your family. This is the best smoke detector of this type we are going to review today. Many smoke alarm reviews refer to this product as the product that all other smoke alarms look up to. The unit is equipped with an industrial grade smoke sensor. It can be silenced from your phone, and the unit is smart enough to automatically test itself. What makes this one of the best smoke and carbon monoxide detectors is the fact that it lasts for up to 10 years. With this unit, you do not have to guess what is wrong because it clearly tells you why the alarm was triggered and will send an alert to your phone. The Split Spectrum Sensor technology allows the unit to detect fast burning fires that do not produce a lot of smoke, as well as slow burning fires such as those on mattresses that produce a lot of smoke. Whether you choose to purchase the battery-powered version or the wired version, it only takes a few minutes to set this unit up and get it connected to your phone. The carbon monoxide sensor is designed to last for 10 years. It is equipped with ambient light sensors, an omnidirectional microphone, a 2 W speaker, and a warning that can produce 85 dB of sound. This is more than enough to alert your family to any danger. It comes equipped with a two year manufacturer warranty. When you look at all of the features this unit offers, including its Wi-Fi connectivity, it’s easy to see why it finds itself topping many of the best smoke alarm reviews. There are no products on the market today that can match the smoke and carbon monoxide detection ability of this product. The First Alert BRK 3120B is considered by many to be the best dual center smoke alarm currently available. It uses photoelectric and ionization sensors to alert your family immediately when there is danger. A nice thing about this product is that it is manufactured by First Alert. This is a company that has built a strong reputation when it comes to designing the best hardwired smoke detectors and the best battery-operated smoke detectors on the market. What makes this unit so powerful is that it has the ability to detect fast fires that may not produce a lot of smoke thanks to its ionization sensors. At the same time, it can detect a slower burning fire that may produce a lot of smoke thanks to its photoelectric sensors. Since this unit has a dual power source, you do not have to worry about the unit failing on you. It is equipped with intelligent sensing technology. This minimizes the chances of you having to deal with false alarms. When the alarm is triggered, it is an 85 dB alarm, which is loud enough to wake everyone in an entire home. Its dual latching features make it a secure unit, and its ability to interconnect with other alarms makes it a nice addition to any home security system. This is an effective yet simple unit. It is the best type of smoke detector to use in your kitchen and hallways. It is reliable and is produced by a company with a reputation for excellence. This product is considered to be the best smoke and carbon monoxide detector because of the features it has to prevent confusion and effectively warn you and your family of danger. It is equipped with a voice warning system that makes audible voice announcements, including fire, low battery, carbon monoxide, and smart hush activation. This eliminates any confusion that could arise if an alarm were to wake you and your family up in the middle of the night. It uses three AAA batteries and ionization sensing technology. It is easy to install, and it is a standalone unit. You do not need to worry about wiring or other complications usually associated with installing a product of this quality. This may be the best type of smoke detector for your home because it will continue to sound a verbal alarm until the hazard has been removed, or until you shut it off. The low battery warning is continuous, but it is designed to trigger once every 15 minutes so as not to be a nuisance. The unit is relatively small, measuring around 5.75 inches in diameter and with a depth of 1.7 inches. It has an attractive white finish and is designed to be tamper-resistant and to resist vandalism and theft. It comes with a detailed user manual, a mounting bracket, and three AAA batteries, all with the goal of allowing you to install the detector quickly and correctly. Many homeowners have stated that this is the best smoke detector for kitchen use. The Kidde KN-COSM-BA is perfect for anyone who is serious about keeping their family safe. It is one of the best battery-operated smoke detectors on the market, offering clarity, effectiveness, and longevity. It is not surprising that another unit produced by First Alert find its way on our list. First Alert for many people is the answer to the question of who makes the best smoke detector. The First Alert PRC710 is a product that is designed to last. It comes with a 10 year battery and is equipped to protect you and your family from smoke, fire, and carbon monoxide. It has a hassle-free guarantee, promising that you will not need battery replacements for 10 years. Its photoelectric smoke detector response is faster than many of its contemporary products on the market. It has a sleek design, allowing it to blend in perfectly with your modern looking wall or ceiling. The patented smoke injury system minimizes the chance of false alarms from cooking or from shower steam. The loud 85 dB alarm is enough to wake the entire home if a hazard is detected. In the case of false alarms, it is easy to simply mute the unit by pushing the test/silence button. The unit is designed to mount on your ceiling or on your wall using a simple twist and lock feature. Smoke detector reviews rant and rave about the unprecedented 10 year limited warranty that First Alert offers for their product. This is, as many smoke alarm reviews state, a simple yet effective product. It does not have all of the bells and whistles that some of the more expensive models that might connect to your phone or to your Wi-Fi system have, but it is functional and will alert you and your family of any fire or carbon monoxide danger. With its sleek white design and lithium battery, this is a powerful yet attractive unit that would work well as a kitchen smoke detector. Since the batteries do not need to be replaced for the life of the unit, it is also a good option for high up areas, such as hallway ceilings that are difficult to reach. Smoke detector reviews frequently comment on how easy it is to install this alarm. In fact, it automatically activates once it is connected to the mounting bracket. Once the unit reaches reaches its end of life, an audible chirp lets you know it is time to remove and replace the unit. A highly visible LED indicator lets you know immediately if the unit is working. Different flashing modes indicate in what setting the unit is operating. The unit has a relatively simple design. There are two buttons on the front and an LED indicator. The test/reset button makes it easy for you to guarantee the unit is working properly, as well as reset it when the need arises. You have the option to silence the unit for eight minutes at a time if you are cooking food that is going to produce a lot of smoke. The ionization smoke sensors are able to quickly identify the virtually invisible particles produced by fire, allowing this unit to respond faster than units that just have photoelectric sensors. This unit is the best smoke detector for individuals who are looking for a simple yet powerful way to detect fire and to alert their family. Its patented design minimizes the chances of unwanted false alarms. 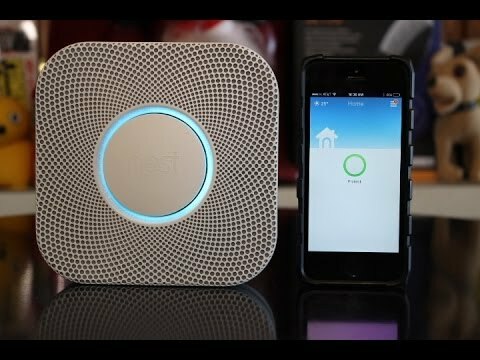 This is a unique approach to monitoring your home for smoke and carbon monoxide. The device is designed to work in conjunction with your home’s smoke and carbon monoxide system. When the unit detects the alarm frequencies for a smoke alarm or a carbon monoxide detector, it will send an alert to your smartphone. It gives you the information for emergency services based on where your home is located regardless of where you are. A unique feature about this product is its ability to contact your friends and family if you do not respond to a carbon monoxide alert notification. The product will work with your iPhone, Android, and Bluetooth. The product is very easy to set up and to connect to your home’s Wi-Fi system. A nice thing about this unit is that it also serves as a nightlight. Many parents appreciate the fact that this device protects their children from any imagined dangers that they might have thanks to the nightlight as well as protects them from real dangers that are caused by fire and carbon monoxide. An advantage that this unit has over other alarm monitoring systems is that unlike other units that claim to be the best smoke and carbon monoxide detector, you do not need to pay a fee to have your home monitored. You have peace of mind with no monthly fees and no installation. This is a novel unit that offers a lot of features. For the price, there are other units that do a similar job while providing a few additional features. The USI Electric MDSCN111 often finds itself on the top of photoelectric smoke detector reviews as well as the best dual sensor smoke alarm reviews. This is thanks in part to its four-in-one design that benefits from both photoelectric and ionization technology. It has the ability to detect fast flaming fires along with slow simmering fires. It is equipped with a microprocessor designed to empower the unit to distinguish between a real threat and a false alarm. The unit can be interconnected with up to 24 other devices. If one alarm triggers, all of the interconnected alarms throughout the home trigger at the same time. This provides sufficient time for you and your family to escape a dangerous situation. The unit has a large mounting base. This is good, especially if you are replacing an existing smoke detector since the large base allows it to hide some sheetrock imperfections. The unit has automatic testing features along with self-diagnostics to make sure that it’s working properly. This is a hardwired unit, but it comes equipped with a 9 V alkaline battery, which means that you are going to be protected even if the power goes out. The battery in the unit is frontloaded, so you do not have to take down the entire unit or remove the bracket in order to install a new battery. Whether you are looking for a smoke detector for your kitchen, hallway, or bedroom, this unit will more than meet your needs. It is produced by a company that has more than 40 years of experience and a stellar reputation when it comes to keeping families safe. How Do Smoke Detector Works? Before you can buy the best smoke detector for your home, you need to understand the difference between a smoke alarm and a smoke detector. A smoke alarm is an all-in-one device. It has a detector that can sense smoke and then produces an audible alarm to warn you that smoke has been detected. A smoke detector is designed to detect smoke. It triggers a building’s fire alarm system and may have a visual indicator showing that smoke has been detected. It must be connected to a building’s fire system. It is not a standalone unit. It is essential that you understand the difference between these two devices when you are reading smoke alarm reviews and choosing what you will install in your home. How Do Smoke Detectors and Alarms Work? All of the best smoke detectors and best smoke alarms work using one of two techniques. They are either photoelectric detectors, or they are ionization detectors. In a photoelectric detector, a beam of light travels from a light source straight across the detector. It is designed to miss the sensor. However, when smoke enters the chamber, light particles scatter, resulting in some of the light hitting the sensor and triggering the alarm. These are the best smoke detectors for home when the fire is smoky and caused by things like mattresses. An ionization smoke detector has an ionization chamber. It responds to small amounts of smoke caused by flaming fires. Inside the detector there is around 1/5000’s of a gram of a radioactive element called americium-241. The ionization chamber has two plates with the voltage going across them. When smoke enters the ionization chamber, the current is disrupted because smoke particles attach to ions, rendering them inert. When there is this a drop in the current between the plates, the alarm is triggered. Smoke alarm reviews speak highly of ionization smoke detectors because they are inexpensive and effective. There are a lot of smoke detectors on the market, and each one of them promises that they are the best smoke detector you can buy. However, since your family’s security is serious to you, you are not just going to trust what a manufacturer says. Instead, you want to do your own research by looking at smoke alarm reviews. The following are some things to consider when choosing a smoke detector and which smoke alarm to buy. 1. Smart smoke detectors take advantage of the latest and greatest in modern technology when it comes to protecting your family from fire. They connect to apps on your phone or mobile device, they can sound alerts, and they are able to communicate with each other and help you to pinpoint exactly where a fire is located. They can call your phone, and if you are not able to answer, they can call a friend or family member to tell them about the situation in your home. 2.Multifunctional alarms not only detect fire, but they can also detect carbon monoxide. They remove the need of purchasing multiple units. Some are battery-operated, some are hardwired, and some are designed to work as a high-bred of the both. Depending on the features that they offer, the prices can vary drastically. 3.Hardwired units, as the name implies, are designed to be connected to your home’s power supply. Most of these units come with a backup battery power source. Since the unit has two sources of power, it is highly unlikely that it is going to lose power. The downside with a hardwired unit is that it requires a little bit more know-how to install it. 4.Battery-operated units are not designed to connect to your home’s electrical system. One plus of having a unit that just uses batteries is that you don’t have to worry about installation. The problem is that your unit will become inactive if your batteries die. An option to look into is smart batteries. These batteries are designed to send a message to your phone when they are nearing the end of their life. With so many features, it can still be challenging to determine which alarm or detectors are going to meet your needs. A lot has to do with your home. If you live in an older home that has older wiring, it might be too expensive to have an electrician come in, bring your wiring up to spec, and then install a hardwired unit. Conversely, if you live in a newer home, it might be a simple thing to use existing wiring to get the benefits of a hardwired unit. A multifunctioning unit may be a good idea if you have fuel-burning appliances in your home, such as a natural gas furnace or water heater. If you do not have these devices in your home, then it is unlikely that you’re going to be exposed to carbon monoxide, and so a multifunctioning unit may not be right for you. Of course, this is not all useful electronic devices that can help keep your home safe. We also recommend you to buy a video doorbell or wireless video doorbell. When determining what smoke detector to buy, it is beneficial to learn about the types of smoke detector sensors you can choose from. Photoelectric Sensors: These sensors are designed to detect slow burning fires that create a lot of smoke. The smoke interacts with light produced by the light source and causes it to trigger the sensor, which in turn activates the audible alarm. Ionization Sensors: These identify fast burning fires that may produce more fire than smoke. They have two metal plates with a minimal amount of radioactive material that ionizes the air. As smoke passes through the device, the ionization is interrupted, triggering the alarm. Dual Sensors: A dual sensor alarm has both photoelectric and ionization sensors. These are the best smoke detectors you can buy because they are triggered with any sign of a fire. It is recommended that you purchase a dual sensor alarm. This is because you have no way of knowing in advance what type of fire may start in your home. With a dual sensor device, you know that you have all of your bases covered. There are other features that you should consider when determining which smoke detector to buy. While not all of these features are necessary for the detector to be effective, they do increase the performance of the unit and the chances of you getting out safe in the event of an emergency. You have three basic power source options. You can opt for battery power, hardwiring, and a wall plug-in unit. Most hardwired devices have the option for a backup battery. So even if the home’s power fails, you still have battery power to rely on. With a battery-powered unit, once the battery dies, your unit stops working. Many companies are producing lithium batteries that will last the life of the alarm, so you do not have to worry about changing batteries every couple of years. The battery backup in your hardwired alarm will warn you when the battery is getting low. Depending on the unit you select, it may chirp, there may be a LED display, or you may receive a low battery voice message. Some alarms come with the option to link them with other alarms in the home. So if the smoke alarm in one room triggers, all of the alarms in the home will sound. Many of these units provide a verbal alert indicating in which room the alarm was triggered. Homeowners who have a multilevel home may want to consider purchasing an alarm or a detector with this feature. In a small single level home, this interconnection may not be necessary. Most carbon monoxide detectors are designed to sound an alarm once the CO levels reach 70 ppm. However, people with certain conditions, such as cardiovascular issues, children, or women who are pregnant may be harmed with as little as 30 ppm of carbon monoxide in the home. The digital display will help you see if the carbon monoxide levels in the home are rising, even if they have not reached a level that would trigger the alarm. When an alarm triggers a false alert, maybe because you are cooking or barbecuing, it can be very unnerving and frustrating. In times past, the only option was to disable the unit by disconnecting it from its power source or unplugging the battery. The downside of this is that it is easy to forget to re-plug in the unit or reconnect it to its power source. Hush buttons temporarily deactivate the unit and then reactivated after a set period of time. Some units have remote control hush buttons or hush buttons that can be activated from your mobile device. Strobe lights are an awesome feature, especially in homes where there are hearing impaired individuals. Some units come equipped with strobe lights, whereas others include the option to add on a strobe light. Most people understand how easy it is to sleep through the beeping of an alarm. However, it is easier to wake up when you hear someone’s voice. This is the principle behind alarms that have a voice alert. Some even have the option of allowing the homeowner to record their own voice or have someone else record their voice so that it can sound in the event of an emergency. In the event of an emergency, it is easy for confusion to ensue. Smoke alarms with safety lights provide a safe path of illumination. This could mean the difference between life and death if an emergency takes place at night. So what is the best smoke and carbon monoxide detector? The answer is going to vary depending on your needs. If you have a home with high ceilings, then a hardwired unit or a unit with a lifelong battery may work the best. If you have a large home, then consider getting a unit that connects with the other detectors in your home. Homes with hearing-impaired individuals would benefit from detectors with a strobe light, and homes with children may benefit from detectors that include safety lights and voice alarms. You understand how having a smoke detector in your home can save your life and the lives of your family. That’s why you are reading this guide. The National Fire Protection Association stated that casualty rates in homes with working smoke detectors were 50 percent less than that of homes without working detectors. The key phrase in this sentence is ‘working.’ If the fire detector in your home is not functioning or if it is not properly located, it will not provide you and your family the protection that you need. It is essential that you take the time to learn about smoke alarm installation and maintenance. How Many Detectors Will You Need to Install? The answer is going to vary depending on the size and layout on your home. It is recommended that you at least have one detector on every level of your home. It’s even better if you can have one detector inside every place in your home where people sleep. This includes basements and attics. Having a smoke detector for kitchen use is a must. Experts recommend that you put one either just outside the kitchen or just inside the kitchen. If you find that your kitchen smoke detector is setting off a lot of false alarms, get one that has a hush button. The hush button will minimize the unit’s sensitivity for a short period of time, allowing you to cook without irritation. As we mentioned, just purchasing a smoke alarm is not enough. Install it as soon as you buy it. There is no reason for your family to go even one night without the protection that detectors provide. Your detectors should be placed on a flat wall or ceiling. They should sit in the center of the room. If you opt to install your unit on a wall, it should be no more than 12 inches from the ceiling. Special care should be used when installing hardwired units. If you are not familiar with electrical wiring, it is best to leave the installation up to professionals. As soon as you install your device, you and your family should go through and activate each device individually. This serves two purposes. First, it helps you make sure the devices are actually working. Second, it familiarizes your family with the do sound of your smoke detectors. During this initial test and installation, take the time to familiarize your family with exit routes and plans of emergency. There are a lot of units that tout their ability to perform self-diagnostics. However, we recommend that you take the time to manually test your devices on a monthly basis. This will allow you to make sure that the sensors are working well and that the detectors are set to an appropriate volume. Many of the units that we reviewed come with lifetime batteries, but some do not. Check the manufacturer’s guidelines for your unit, and then schedule periodic battery changes. A good rule of thumb is to replace your non-hardwired unit batteries every single year. The manufacturer’s guide will walk you step-by-step through how to replace battery in smoke detector. Take the time to clean your unit, removing dust and pollutants every single year. This is especially important when discussing a kitchen smoke detector. Since you will be regularly cooking and creating smoke and steam in the kitchen, it is easy for these detectors to become dirty, and this can impede their performance. Cleaning a smoke detector is a simple process. Simply take the device off the wall or ceiling, disconnect it from the power source, remove the external casing, and then use compressed air, a dry cloth, or a vacuum to remove any dust that has accumulated. It is not recommended that you use liquid sprays or cleaners as these can interfere with the device’s sensors. Smoke detector maintenance can seem a bit overwhelming and some may consider it to be a nuisance. However, families who took the time to maintain their unit and as a result were able to escape a dangerous situation unscathed were happy that they did the work. The opposite is also true. To help you remember to do maintenance, we recommend that you schedule your monthly and annual maintenance to coincide with a date that you will always remember. Fire safety and smoke detector maintenance are part of being a responsible homeowner. Hopefully, you will never have to deal with a fire, but if you do, you are going to be thankful that you and your family were prepared. Most manufacturers recommend replacing the smoke alarm every 10 years. Why is this recommended? The NFPA 72 National Fire Alarm and Signaling Code states clearly that smoke alarms should not be used for more than 10 years from the date they were manufactured. From this point, an alarm cannot to be counted on to provide the needed protection. Are there any areas where I should not install a smoke detector? Smoke detectors should not be installed inside your kitchen. They should be installed just outside the kitchen. This is also true of any other place in your home where dust, fumes, or steam is likely to collect. If a smoke detector was installed right outside of the bathroom, steam generated during a hot shower may trigger it inadvertently. My home alarm system has a smoke detector. Is this enough? The smoke detector that comes with your alarm system is going to be as good as one you will purchase for yourself. It is good to verify that you have enough detectors installed. If not, purchase more. As a rule of thumb, you should have detectors outside of every bedroom, at least one detector on every level of the house, and detectors inside bedrooms. Do I really need to test my smoke alarm every month? Yes. Monthly testing will allow you to guarantee that your batteries are still working in a battery-powered unit and that units that are daisy chained together have not had any wire damage done by either an animal or wear and tear. Most units have a very simple test button on them and can be tested in just a few seconds. There are a lot of options available when selecting smoke detectors. You do not want a smoke detector that is sub par, that has a lot of false alarms, or worse yet that will not trigger when you need it to. All of the units that we have mentioned have stellar smoke alarm reviews and have worked well for many people. As you search for the best smoke detector for your home, keep in mind some of the available options as well as the size and layout of your home. To get the most out of your unit, you will need to become familiar with and follow the manufacturer’s recommendations. Test your unit frequently, and replace batteries when needed. Regardless of the model or unit you choose, it is essential that your home has one. If you do not have smoke detectors, if you do not have a sufficient amount of them, or if your smoke detectors are reaching their 10 year limit, now is the time to take action and replace them. You can purchase smoke detectors at brick-and-mortar stores, and there is nothing wrong with that. However, our recommendation is that you purchase online from stores like Amazon.com. Purchasing online allows you to take advantage of discounts not available at brick-and-mortar stores. You are able to read smoke alarms reviews, do side-by-side comparisons, and purchase the smoke detector you need from the comfort of your home. We have tried to provide you with a detailed and concise description of some of the best smoke detector models available. Now the choice is yours. Do not put your and your family’s safety at risk any longer. Buy a smoke detector today.